But where does our idea of sustainability come from? A book by Ulrich Grober, recently translated from German into English, takes us on a journey from the humble origins of sustainability several centuries ago to its 21st-century ubiquity. Along the way, Grober also explores the history of ecology and our idea of the environment. One of the many interesting facts the reader learns is that the English words environment, ecology and sustainability all originated in German. Environment, for instance, can be traced to Goethe. In his memoirs, Goethe used the word Umgebung, which was translated into English by Thomas Carlyle as environment, a word he created for that purpose based on the existing English verb environ, and which later acquired the ecological connotation it has today. But the real cradle of our current concept of sustainability was the forestry sector. Wood was a key resource for fuel and construction (particularly ships). With the realization that forests were disappearing rapidly, people in countries around Europe realized that they needed to treat this important resource differently. For instance, Sylva, a report written in 1662 for the Royal Society by John Evelyn, detailed the decline of forests and the steps needed to reverse it, and was a big success. The word sustainability itself was first coined in German, by Hans Carl von Carlowitz, in his Sylvicultura oeconomica in 1713. Carlowitz, like Evelyn in England, had been tasked with solving the wood supply problem for the mines in Saxony. He argued that only as much wood should be harvested as could be replaced by new growth and used the term nachhaltend to describe forestry practices that were soon adopted in Germany. Nachhaltend is the seed of what became Nachhaltige Entwicklung (in English: sustainable development). In the 19th century, the concept of sustainable forestry practices spread throughout Europe, and the term was translated in parallel. It went via multilingual Switzerland from German into French (produit soutenu, i.e. sustained yield) and then into other languages, including English, thus forming the basis for the later creation of the concept of sustainable development. In later chapters he goes on to describe the further development of environmentalism and sustainable development in the modern era, but the most interesting aspect is the story of its genesis and growth before entering mainstream 20th century environmentalism. The book does a fantastic job of unearthing that history, and is a very enjoyable read. 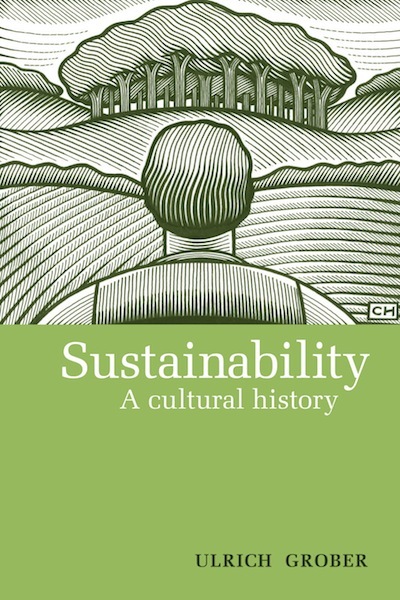 Ulrich Grober, Sustainability: A Cultural History. Published by Green Books, October 2012.